ProSAM Suite » Sigma Systems, Inc. The ProSAM Solution Suite is a complete financial aid solution for post-secondary educational institutions. 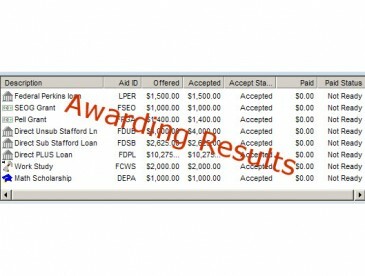 It is used in some of the most esteemed educational institutions in North America to manage their financial aid needs. It is a highly-customizable, rule-based system that has been deployed on a number of different platforms, including Windows-based and Unix-based servers. In the last twenty years alone, our software has processed over sixty billion dollars in state and federal financial aid. While maintaining the robust functionality and features of its predecessor, SAM (Student Aid Management), ProSAM is enhanced with an easy to use graphical user interface [GUI] and greater range of support for host systems. It is designed to use flexible and secure client/server technology and integrate with institutional student information systems as well as other enterprise applications. It offers an unparalleled combination of immediate on-line processing as well as strong back-office functionality. With the use of ProSAM Workbench and ProSAM Locksmith, users are able to tailor ProSAM to fit their needs through user-defined configuration tables that establish the majority of processing options and enforce the institution’s core business rules. Every major financial aid process from aid application to disbursement can be customized to allow for differences in correspondence, budgets, packaging philosophies, disbursement schedules, and more. Workbench and Locksmith affords the user the same easy to use graphical interface as ProSAM. Different groups of users can be assigned different security configurations that restrict their access to only appropriate content. Integration with enterprise single sign-on frameworks and MS Active Directory and LDAP are supported for ease of administration. ProSAM offers a few different ways to configure the user experience to satisfy the diverse needs of different categories of users. To support different levels of responsibility whole modules can be suppressed from view. ProSAM supports configurable control over the ability to view, update, and/or delete content all the way down to the individual field level. Users in other departments on campus be can be restricted to view, update, or no access to different groups/categories of students and access can also be limited to or for specified funds. There are modules designed to present aggregated and consolidated content for staff filling a “help desk” type of role. There are other modules, such as the Award Posting (Limited) module, designed to allow less skilled users to perform award packaging tasks that enforce appropriate (and sometimes complex) limits through the use of intelligent and dynamic restrictions. 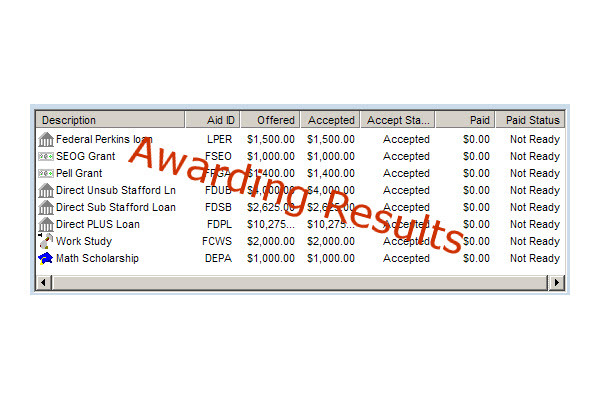 Furthermore, non-financial aid power-users such as departmental staff can be offered access just to their students, and just the specific awards managed by their department/division. In addition to supporting the common data exchange formats like ISIR, Electronic Corrections, COD Common Record and Reports, and NSLDS Inform/Monitor/Alert layouts used by Federal servicers, ProSAM also supports CSS Profile and PHEAA data exchanges. Sigma also offers support for many state grant processing layouts via our optional state grant modules. Sigma has worked in partnership with our clients to build fully automated and industry leading functionality to support these individual state grant programs. ProSAM is designed to integrate with an institution’s chosen student system. Sigma supports both high volume and real time student system integration via a variety of technologies that can be adapted to many student and student accounts receivable systems. If additional institution-specific functionality needs to be added, ProSAM offers multiple methods to achieve the desired results while still enforcing the core business rules. This can include institution specific code maintained by Sigma as well as ancillary processes developed by the institution. Additionally, with the use of ProSAM’s Workbench, the user is afforded an easy to use graphical interface tool to apply the institution’s business rules to the ProSAM product. As opposed to the traditional method of annual processing, ProSAM’s term-based Applicant Summary module and associated features allow you to budget, package and disburse aid utilizing data on a term-by-term basis. This allows for greater automation of what are typically manual steps in many other systems. The ability to associate the correct family contribution to each term, automatically build the student’s budget and award package based on data specific to each term, and automatically repackage as often as necessary to keep the package correct based on changing factors affecting their level of unmet need and enrollment are very powerful features. Term-based packaging (and re-packaging) offers the ability to build a packaging philosophy that is more flexible and able to be re-run as often as needed for any student. This approach allows adjustment to a student’s package on a term-by-term basis to account for changing factors critical to communicating an accurate package, to assure regulatory compliance, and to meet institutional packaging methodology objectives. Enrollment level fluctuations, class level fluctuations, EFC changes, student aid budget changes, updated loan history data, and other term-specific factors can all be handled automatically and appropriately by the packaging process, resulting in student aid package adjustments that do not involve staff time to manipulate. Strategic and scarce aid awarded during initial packaging (such as that assigned to complete leveraging objectives) can be preserved during re-packaging even if the funds are currently depleted, yet adjusted as necessary to prevent any type of student over-award. The Memoranda module permits users to easily enter notes about steps taken to process a student’s application for aid such as to document professional judgment or verification. Also, rules defined by the user will enable programs to enter notes in this module about actions taken by programs for the student. Entries can be created for a specific processing year or can be non-year specific to allow information to be carried throughout the student’s academic attendance. Also, certain standard Sigma applications, like packaging, can optionally store memos that include snapshots of their processing results for ease of historical reference. Not only can ProSAM work with students on a large scale, it can also help financial aid professionals work with students one-on-one. Since navigation follows Windows standards, movement from student to student or function to function is intuitive. Advisers can utilize the efficient summary screens, or manipulate the detailed data that exists “behind the scenes”. Generation of student budgets, award packages, and correspondence can all be accomplished in real-time and in full compliance with institutional philosophies. With the use of XML complex letters can be generated with the school’s logo or an actual signature to give a more professional appearance. In addition, letters can be sent to the student via email thus reducing the cost of expensive mass mailings. The ProSAM application server is designed to be platform independent and ProSAM will function with most popular databases. This design allows institutions to choose which platform meets their needs and facilitate movement to alternate platforms as computing options and/or institutional preferences change. This module supports the near-real-time loading of student data from capable student information systems into ProSAM through the use of XML based document exchange. Sigma provides an XML schema which can be easily mapped to the data available in any student information system. As this data is pushed to ProSAM it is validated for schema compliance and then instantly stored. The data can then be run through a highly configurable translation process and applied to the appropriate records in the ProSAM system. Data that is received can automatically trigger events, such as rebudgeting and/or repackaging, to occur within ProSAM. Supported data types include demographic data, address and electronic communication preferences, general student characteristics, academic year student and admission characteristics, specific term academic and admission characteristics, enrollment, academic progress, etc. Sigma can also support the real-time posting of disbursements authorized by ProSAM into student accounting systems that support XML-based exchange of data for this purpose. Please contact Sigma for more information about this possibility. 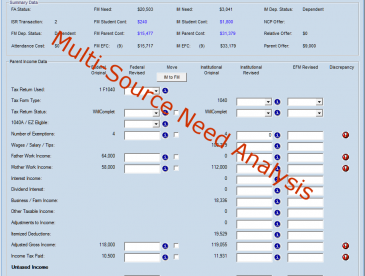 The Multi-Source Need Analysis module is a method for reading and storing student information from multiple different sources. In addition to FAFSA data coming in on the ISIR files, this module can track data from the CSS Profile service, International student applications or even home-grown returning student applications. The ability to see data side-by-side and move numbers from one source to another makes it an essential tool for schools balancing multiple streams of student data. Keep track of different calculations as well, allowing schools to award aid to their students based on federal, state and institutional contribution amounts. With the use of our dynamic online processing, verifying reported ISIR data with actual documents received such as tax forms and various worksheets is easily tracked and performed. The data is then ready for the automated process to create the corrections file to be sent directly to the federal processing center. Estimated EFC’s can be dynamically computed using the same federal specifications as the Department of Education to allow for generating an estimated financial award package prior to receiving the official EFC. Sigma has an entire module dedicated to automating Federal verification compliance and seamlessly integrating the results of the verification analysis into the core needs analysis data as appropriate. The process of tracking changes to data, whether via online or volume processes, offers managers a before and after snapshot of any or all data elements in the ProSAM system. An online view of the audited elements affords an easy tool to view this data, and can be filtered to locate a specific value and can be filtered to locate a specific change event. ProSAM has a special set of features designed to make interoperability with SAP Student Lifecycle Management as seamless as possible. Sigma and SAP have developed a set of real-time, bi-directional integration features that fully support the needs of joint SAP and Sigma clients. ProSAM is designed to present real time SAP data within its online screens, and to make use of SAP student data when making budgeting and packaging decisions as well as disbursement authorizations. The full power of SAP SLCM is leveraged to make determinations such as class level, enrollment, and satisfactory academic progress that are tailored to the specific needs of financial aid. Both estimated and actual disbursement authorizations can be passed in real time from ProSAM to the student’s account in Campus Management. This set of robust interoperability harnesses the strengths of both products while not sacrificing the need for timely financial aid regulatory updates. 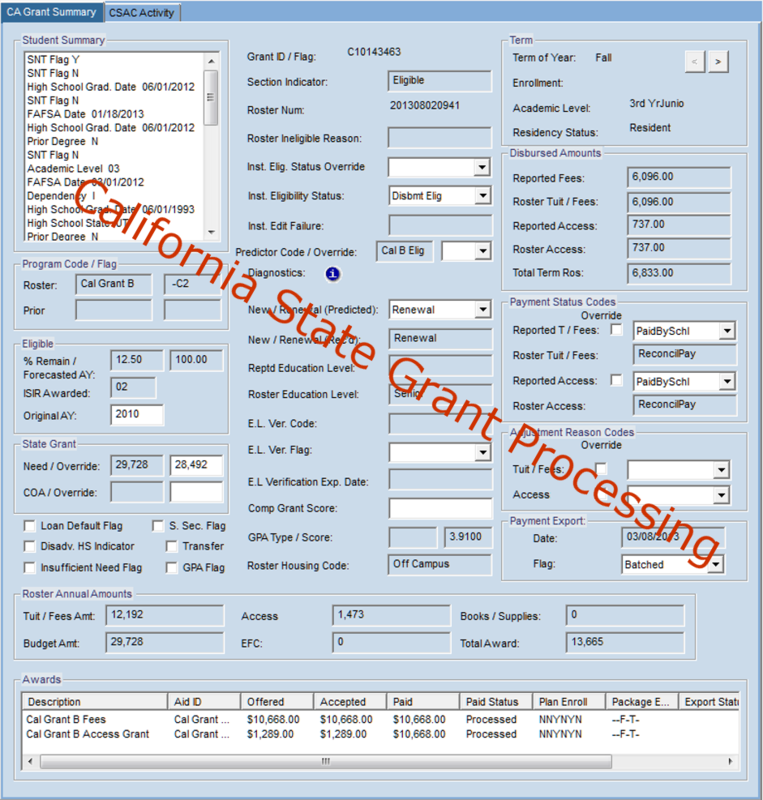 Fully automated state grant processing support is presently available for some states, and Sigma can propose the development of a state grant processing module for any state not currently supported as an option in our proposal and pricing. Sigma is generally able to automate all eligibility checking, awarding, electronic data exchange, disbursement, and reconciliation processes for state grant programs that we undertake, saving many person-hours of manual work and/or preventing the need for individual campuses to develop and maintain these processes. 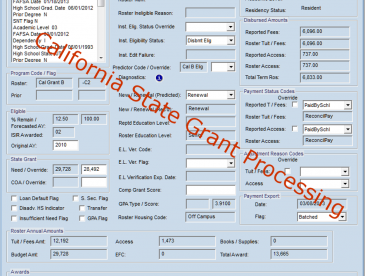 Please inquire about your specific state grant processing needs if automating this process is of interest to your institution. The Diagnostics module provides the client a means to effectively communicate the actions which need to be taken by students or financial aid staff before a certain financial aid process can occur. Strategic Sigma applications can automatically store processing exceptions as diagnostic records. This module was also designed to give the institution control over both the content of the diagnostic messages, and user defined business rules can be used to assign these messages. Diagnostics provides an effective means of communicating with students, either via the Web, email or written communications. Diagnostics messages can help students identify processing issues via web-based student self-service (through the use of Sigma web services functionality), thus allowing the automated flow of financial aid processes to continue. Diagnostics messages can also provide clear information to financial aid staff on the problems certain students are having as well as specific instructions on how to resolve these issues. With the ability to link diagnostic messages to a specific link on a web site, students and staff can be provided even more detailed instructions. Certain diagnostic messages can be also be flagged as critical alerts, which provide a prominent visual reminder to staff to check out the message before advising the student. Some of the largest and most prestigious higher education institutions in the United States rely on Sigma’s products to efficiently track and process aid for many thousands of students. ProSAM is designed to automate many back-office processes including electronic exchange of ISIR data and corrections, federal methodology calculations, Direct Loan and Pell Common Record origination and disbursement, correspondence generation (electronic or hardcopy), funds management, and a multitude of reporting requirements (including FISAP). These processes are fully supported without the use of the Department of Education’s EdExpress product. Furthermore, ProSAM can flexibly assign student budgets and package awards based on institutional philosophy while staying in full compliance with current federal regulations. The ISIR Management module offers the institution the opportunity to pre-process ISIR’s before loading them into ProSAM and analyze the differences between all ISIR’s received for each student. Key features of this module include the ability to store and retrieve all ISIR’s received (regardless of whether they are loaded), to match ISIR’s against students/prospects already known to the institution, to compare incoming ISIR data to data already received, and to utilize selected data on the ISIR as a “lead” for recruitment purposes for other areas of the institution. Basic match logic is supported by the module with minimal user configuration. If desired by the client, Sigma can customize the capabilities of this module to perform advanced match logic for incoming ISIR’s against data already present for the student. For example, Sigma has supported the automated review of incoming ISIRs where the SSN, name, date of birth, and zip code in the ISIR do not automatically match those of any existing student, but may in some cases be a very close match. Incoming ISIR records that do not perfectly match and also fail a series of additional “close enough to an existing student” checks can be suspended for subsequent manual review. If appropriate, user definable business rules can also be leveraged to further evaluate the incoming ISIR against the student’s currently loaded ISIR data to trigger a variety of special purpose actions that may be needed. ISIR fields can be automatically analyzed based on user defined business rules to insert one or more pieces of required documentation based on data items such as comment codes, match flags, or data discrepancies. These features are particularly beneficial when ISIR corrections are received after verification has already been performed and/or disbursements have already been made. A side by side comparison of two or more ISIR transactions for a specific student can be performed on-demand, and an appropriately authorized staff member can choose to load a different ISIR than the one currently loaded into ProSAM. These features can be particularly beneficial when both the student and/or another institution is concurrently making adjustments to the student’s ISIR data while your institution is also trying to send appropriate changes to the ISIR. The full ISIR or just the NSLDS data contained in the ISIR can always be loaded on-demand regardless of the result of the ISIR Pre-Processor logic’s determination of whether the ISIR should be loaded. 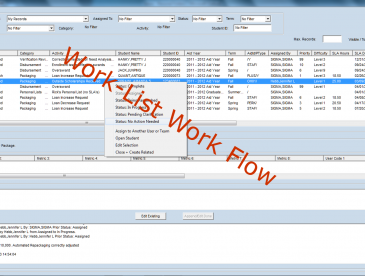 The Work-List module provides users and management a way to keep track of lists of items/issues that need some aspect “worked” manually. Q: Which platforms will ProSAM run on? A: The ProSAM server can be installed on the Windows Server operating system and Unix / Linux variants. The ProSAM client will run on Windows 2012 and earlier operating systems. Q: Does ProSAM handle Borrower Based Stafford Loans? A: Yes, ProSAM can automatically award Borrower Based Stafford Loans in volume and Immediately for individual students. Correct Loan periods and checking for all Borrower Based requirements are done by the software without the need for user intervention. Multiple overlapping loans are correctly reconciled with date limits automatically too. Q: Does ProSAM awarding module handle Stafford for Graduating Seniors? A: Yes, full flexibility to award prorated Stafford amounts for Graduating Seniors are made using credit hours, or projected enrollment for a student in their final term as a senior. Q: Will ProSAM automatically handle State Grant awards? A: Yes, currently many states such as Illinois, California, Florida and Kentucky, are automatically handled for grant eligibility, tracking of previous awards and remaining eligibility to award these state grants. Other states may be awarded using our Rules Based Awarding features and any further awarding methodology needs may be incorporated by Sigma. Q: Does the ProSAM software support the Oracle Version 12c database? A: Yes, ProSAM supports the Oracle Versions 12c, 11g, 11.1 and 10.2 database. The software currently sent to Sigma users in the Oracle environment will work under any of these versions of the Oracle database. No new software is required for a current Oracle user to upgrade to a newer version of the database. Users wishing to convert to Oracle from another database or file system should contact Sigma Systems at (800) 747-4462. Q: What version of SQL server is supported in ProSAM? A: ProSAM is in production use with the SQL Server 2014 and earlier releases. Q: Is the ProSAM system user defined and controlled rules based? A: Yes, ProSAM is driven by user configured rules to control document tracking requirements, budgeting, award packaging, diagnostic (message) assignment, selection, reporting and auditing, and many other processes. All ProSAM processes can exclude students from processing, and even assign a diagnostic message to the student recording the exclusion reason, based on user defined rules. Q: Can ProSAM process Direct PLUS Loan Applications, and can the student automatically be awarded PLUS based on the receipt of an application? A: Yes, the Loan Application module in ProSAM tracks every application and update that is received. Students can be automatically packaged with a PLUS award using the requested amount from the application or maximum amount of eligibility. A PLUS award can also be offered prior to receiving an application and then automatically linked to the application when it is received. 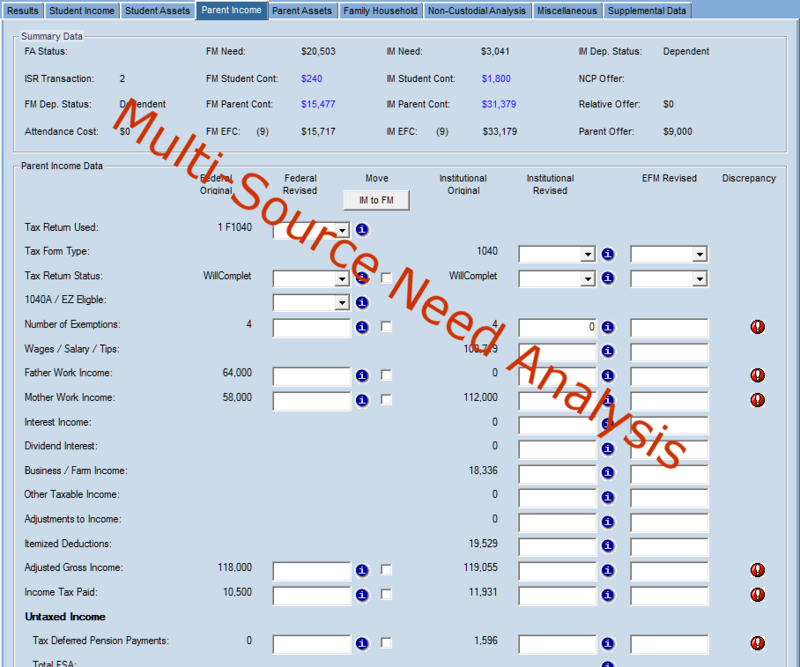 Q: Can ProSAM automate Direct PLUS Loan processing for multiple borrowers? A: Yes, ProSAM can automatically package a student with multiple PLUS loans for different borrowers. All borrower information and each application is associated to the student. Q: How long does it normally take to implement a new Financial Aid system? A: The answer to that, of course, varies based upon the needs of the school. The time frame from the initial discussions about office needs and current pain points to the moment the system goes live can be as short as six months, but typically lasts around 18 months. This time is spent evaluating current processes, understanding ProSAM modules designed to handle each process and configuring them to work exactly as your counselors and staff desire. Inevitably there are gaps between the needs and what the software currently supports which Sigma views as an opportunity to strengthen the product for all clients as those gaps are addressed.